Okay, for clarity, I'm attaching the image. 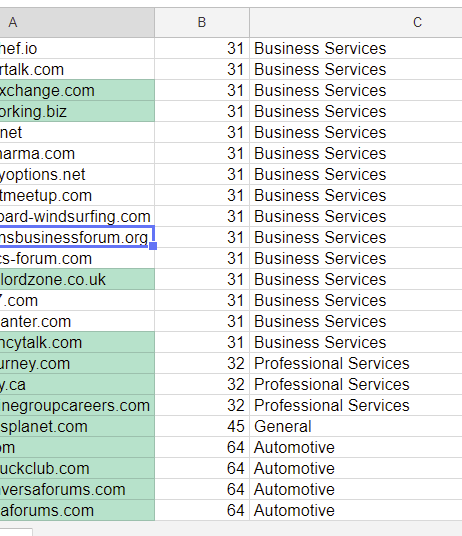 I have sorted out the URLs in column A based on the category in column C. But, the main problem is that the list is derived from a database and the there are duplicates of the URLs in multiple categories. I need to identify what URL exists in what category before finding the duplicates and getting rid of those. Is there a tool for automation or is it possible to do it without human intervention. So far, humans are involved. To write the spec for an app or tell the AI what needs to be done. Google Sheets while being a fine thing may not have a way to write apps, macros or an AI to do what you ask. So back to how its been done for decades. Write the spec, then the app to do what you want on demand. spreadsheets are the each column are not linked to then specific row. Whereas a database each column is like to the row. So when you sort a DB it sorts the whole row. A spreadsheet the columns aren't specifically tied to the rows. You have to manually set the spreadsheet to sort by rows using ranges. I could automate the process. Thanks, Bob. That's called a n:n-relationship. A category can contain more than 1 URL and a URL can belong to more than one category. That fits easily in a relational database (using a 'linking table') and not in a spreadsheet. So if you want to see that, it seems the wrong tool. The “Unique” function will allow you to remove duplicate items from a single row, or several rows. This is a great tool for deduplicating a list of contacts, email addresses, and many other types of lists. The function is described in sheets as: Returns only the unique rows in the source array, discarding duplicates. The rows are returned according to the order in which they first appear in the source array. Off-topic link removed by moderator.